Colombia’s President Ivan Duque has reactivated arrest orders against the leaders of the county’s last remaining rebel group after it was blamed for carrying out a car bombing on a police academy that left 21 dead. In a televised address Friday night, Duque asked Cuba to hand over the 10 peace negotiators of the National Liberation Army, or ELN, who have been living on the communist-run island as part of a peace process. U.N. Secretary-General Antonio Guterres told reporters at U.N. headquarters that he has reiterated his strong condemnation of “the terrorist attack” in Colombia that left 21 people dead and wounded dozens of others. He said Colombian President Ivan Duque called him on Friday. Colombian authorities say a suspect has been arrested for his alleged role in Thursday’s car bombing at a police academy that killed 21 people. Chief Prosecutor Nestor Martinez said that in intercepted phone conversations a man named Ricardo Carvajal recognized his role in the attack. He said he was arrested in a pre-dawn raid in Bogota on Friday in which authorities also seized military uniforms and a rebel combatant manual. He will be charged later Friday with terrorism and murder. Martinez didn’t say what role Carvajal allegedly played. But he said security cameras in the area show that a man got out of the Nissan pick-up used in the attack less than 10 minutes before the blast. The attack was the deadliest in Colombia since 2003. Authorities said rebels from the National Liberation Army were behind the bombing. Colombian authorities said that Thursday’s car bombing against a police academy that left 21 dead was carried out by a member of the country’s last remaining rebel group. Defense Minister Guillermo Botero said in a press conference that the man who carried out the brazen attack, Jose Aldemar Rojas, was a member of the National Liberation Army and known by his alias Mocho Kiko. He said Rojas was an explosives expert who had lost his arm manipulating explosives during his long career in the ELN rebel cell near the border with Venezuela. Authorities have yet to identify what armed group was likely behind the attack. But they said a 56-year-old man named Jose Aldemar Rojas drove a 1993 Nissan pick-up loaded with 80 kilograms (175 pounds) of explosive past a security checkpoint to carry out the attack. 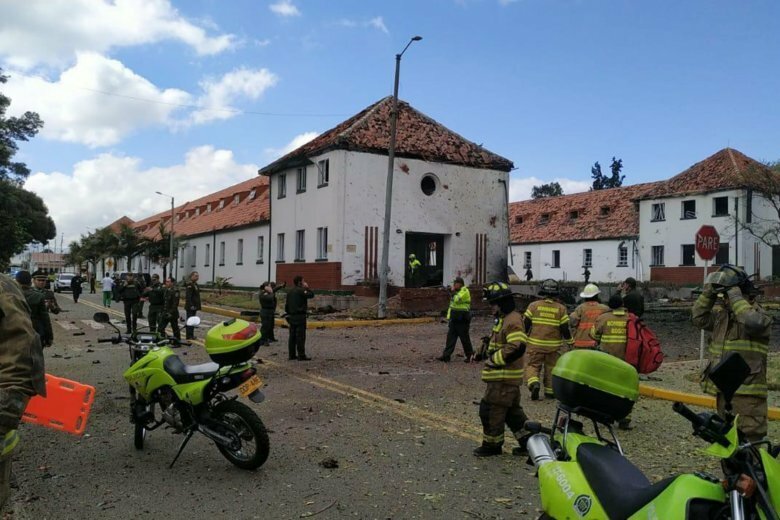 The Thursday morning bombing, which left 10 dead and dozens injured, was the deadliest in Bogota in years and proved especially unsettling because the target, the General Santander school in southern Bogota, is one of the most protected installations in the capital.